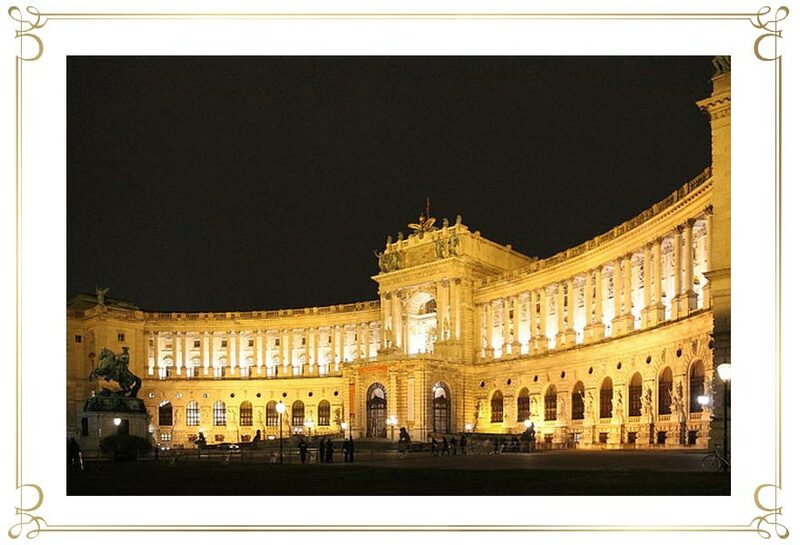 The Hofburg is the former imperial residence in Vienna. 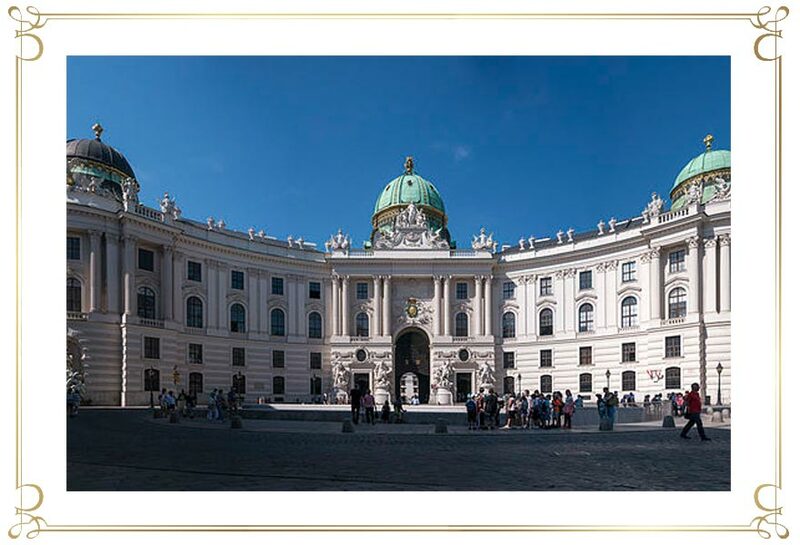 The Hofburg building complex was built between the 13th and the 19th centuries. Six centuries of construction have strongly shaped the building’s appearance. The different wings of the former imperial residence portray the architectural periods of Gothic, Renaissance, and Baroque up to Classicism and the Wilhelmine era. Until 1918 the Hofburg Palace was the seat of the Hapsburg dynasty. Almost every ruler had parts added or altered or redesigned and decorated for his family and himself. A smaller hall leads to the grand Festival Hall, which was erected under Emperor Franz Joseph I in 1908 and completed only in 1923. The impressive ceiling frescos by the painter Schramm display Emperor Franz Josef I’s device: “Viribus Unitis” (Latin, “with united forces”) and the reigning power, Austria.. The center image shows Austria surrounded by allegoric depictions of religion, justice, bravery, science, art, and agriculture. The 15 lunettes by Veith show significant rulers of the Hapsburg dynasty. Other octagon sections by the painter Stauffer include images of Commander Charles of Lorraine (Karl v. Lothringen), John Sobieski – King of Poland, Commander Prince Eugene of Savoy, State Chancellor Prince Kaunitz, and Prince Metternich. Leaving the Festsaal a side gallery leads to the Ceremonial Hall, built in the Classicist style from 1802 to 1806 under Emperor Franz I by the Court architect Ludwig Montoyer. The magnificent cassette ceiling is carried by 24 round columns made of artificial marble, the so-called “stucco lustro”, which was in vogue at the time. In 1810 Napoleon I chose the Ceremonial Hall for his courtship and to ask Emperor Franz I for the hand of his daughter Archduchess Marie Louise. Until the end of monarchy in 1918, the Hall served as the throne room where Emperor Franz I gave knighthood to many Peers. Emperor Franz Joseph I (1830 – 1916) and his wife Elisabeth held annual symbolic foot washing ceremonies and washed the feet of 24 old men and women. This ritual was to honor the peoples’ religious customs and the reigning couple saw it as their personal matter of care. The Ceremonial Hall accommodates court concerts and balls. Emperor Franz Joseph I and Empress Elisabeth held grand gala evenings such as the “Ball bei Hof “(Court Ball) to which only the Royal Household and high aristocracy were admitted. In 1890, the notion of a future building to host musical festivals emerged and the idea was to create a new multi-purpose building that should be more appealing to the broader public than the traditional Vienna Musikverein. Architect Ludwig Baumann had the first idea: His “Olympion“ should hold concert halls, an ice skating rink, and bicycle clubs, and also include an open-air arena for an audience of 40,000. This specific plan was abandoned but the general notion remained, and the construction of the Konzerthaus began in December of 1911. The same Ludwig Baumann, together with famous theatre architect Ferdinand Fellner and Hermann Gottlieb Helmer, designed the building so that performances in the three large halls (Great Hall, Mozart Hall and Schubert Hall) can take place simultaneously without disturbing each other. 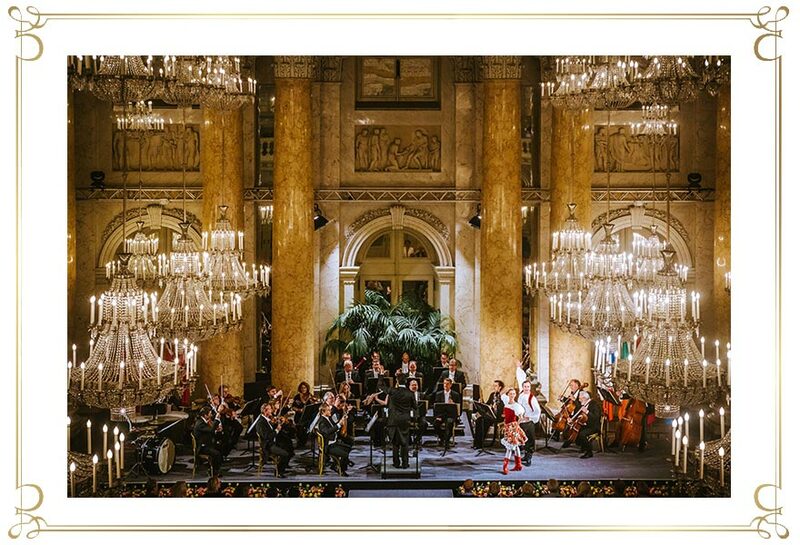 From the very beginning the Wiener Konzerthaus’ cultural purpose and artistic mission was clear: «To be a place for cultivating fine music, a staging area for artistic endeavors, and to be a house for music and a house for Vienna. » It was in this spirit that the Konzerthaus celebrated its opening on October 19 in 1913 with a festive concert in the presence of Emperor Franz Joseph I. Richard Strauss wrote his «Festival Prelude opus 61» for this special occasion, the performance was followed by Ludwig van Beethoven’s 9th Symphony. 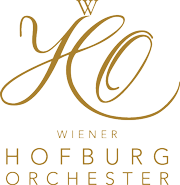 This kind of program –combining a contemporary piece and a masterpiece from the past – was to become exemplary for the Vienna Konzerthaus: the agenda of cultivating tradition and at the same time supporting innovations has become the foundation of the Konzerthaus’ musical world and forms its artistic identity. Social upheavals and financial crises between the two World Wars have significantly shaped the Konzerthaus’ artistic profile and also led to a versatility in regards to its cultural offering, which from the present perspective has proven to be groundbreaking. In addition to the constant cultivation of the classical repertoire the programs in the 1920s and 30s featured significant premiers, Jazz and popular music concerts, literature readings by famous writers, psychic lectures, expressive dance performances, symposia, conventions, as well as fencing and box world championships. In the years between 1938 and 1945 the Vienna Konzerthaus suffered from cultural depletion. Under the destructive pressure of the national socialist dictatorship the Konzerthaus became a location abused for propaganda and Nazi entertainment and was largely deprived of its central cultural content. 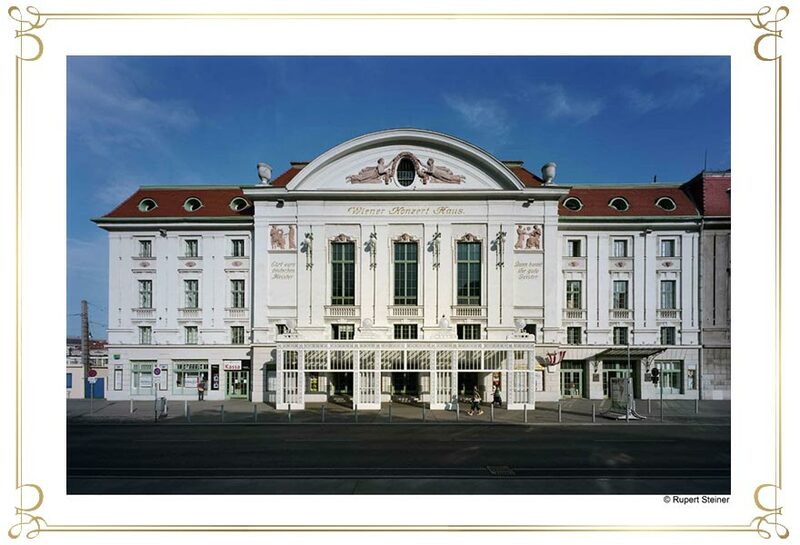 After World War II the Konzerthaus played an important role in revitalizing and renewing the Austrian musical life. It rapidly became a leading organizer of modern music performances in Austria and was much in demand for international Jazz events in Vienna. 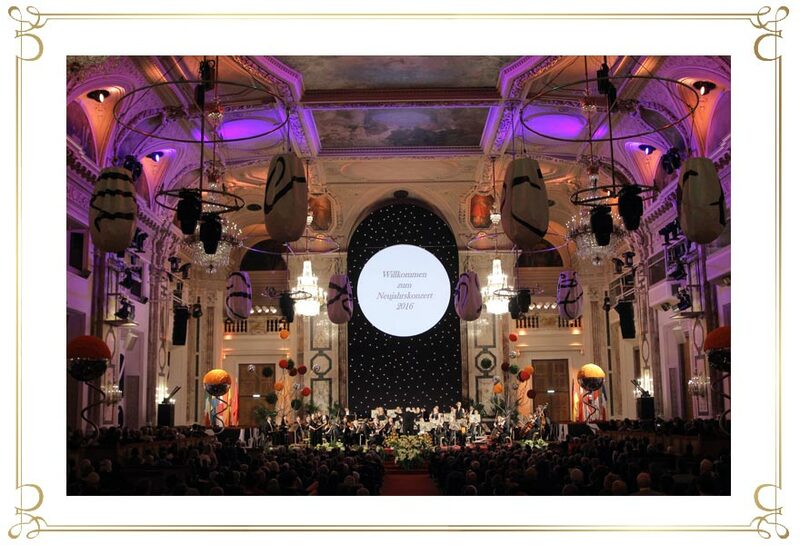 Events fathered by the Konzerthaus have set significant standards in Vienna’s culture. 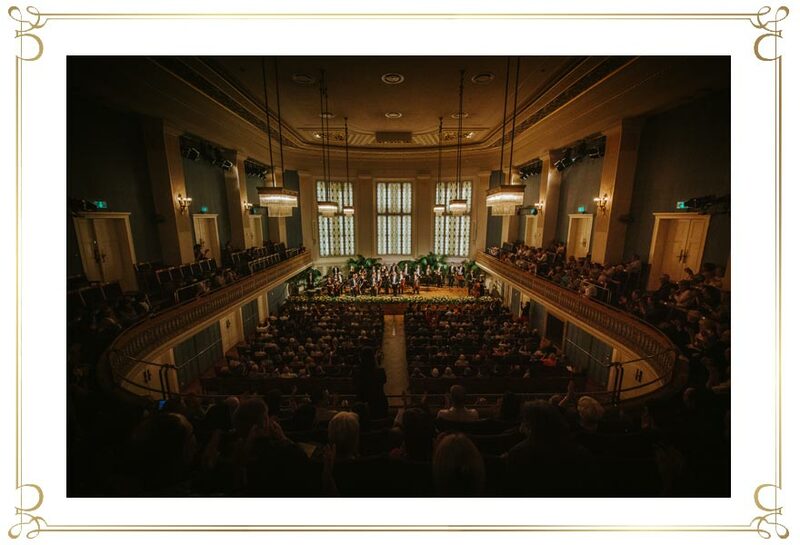 Old music, Jazz and modern music have become important components of the Konzerthaus’ program and complement is primary artistic focus – classical music in its traditional abundance. The Vienna Konzerthaus’ unique atmosphere does not only attract international music artists, but also serves as a popular location for other social events such as balls, conventions, dinners, company presentations and parties. The famed Konzerthaus’ service at events has a long tradition going back to the twenties, whereas the broad range of programs and performances definitely point to the future. Due to the extensive reconstruction measures between 1998 and 2001 the time-honored building is equipped to meet the challenges of the third century.